Okay, this one’s not about birds… but it may change your thinking? This was just an email floating around, but definitely worth the read. It’s quick and may change your point of view. window. The other man had to spend all his time flat on his back. where they had been on vacation. landscape, and a fine view of the city skyline could be seen in the distance. Although the other man couldn’t hear the band – he could see it. Just ironic that this old blue bird house had a predator guard on the entrance! Of no use to any bird now, it’s downright dangerous for any nestlings. Wide open to predators, though I’ve probably discarded a fine squirrel home 🙁 Because it was attached to a tree, surrounded by brush and limbs, it wasn’t exactly bluebird real estate. Someone had nested in there, the thick moss nest was likely built by a Titmouse, Nuthatch or Carolina Wren. 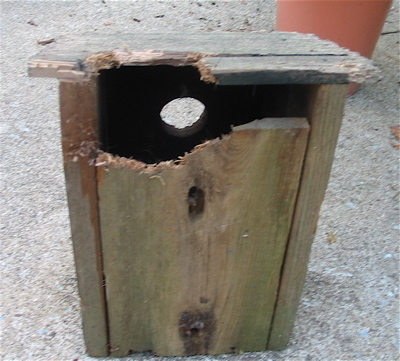 Now is the time to check blue bird houses (and all nest boxes) for repairs and nest removal. They’ll still be a welcomed environment during the off-season! 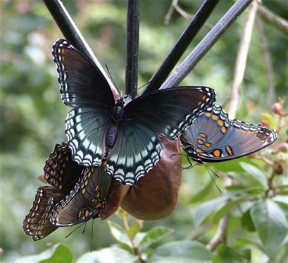 As swell roosting spots for lots of feathered friends… through fall and winter. Adding shavings to your houses helps to insulate them, but always opt for pine, as cedar shavings can cause irritation. Be sure to discard any nests in the trash, as predators will be attracted to them. Grabbing them with a plastic bag (from the grocery store) is pretty quick & easy. 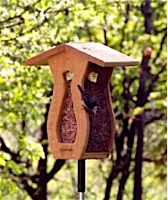 It’s a good idea to clean and disinfect blue bird houses to rid them of mites or other pests. A solution of bleach and water does the trick well, at a ratio of 1:10. Scrub with a hard-bristle brush, rinse well, and let air-dry. As far as the rotted house pictured? It was headed for the trash, but second thoughts say leave it for the squirrels! A brief summary of the book: When journalist Kim Kavin decided that she wanted a puppy, she did what millions of people do every year: clicked on an online photo and submitted an application. She had no idea that the adorable brindle–advertised as healthy and near her home in New Jersey–was actually a last-minute rescue from a gas-chamber shelter in North Carolina. Blue had arrived in the Northeast with at least a dozen other dogs in an RV that is just one among countless transports whose sponsors are dedicating their efforts to saving dogs by any means possible. Blue was happy and friendly, but he seemed to have endured some unusual albeit unknown ordeal. The dog’s manner prompted Kavin to trace his history all the way back to a long row of cages where Blue had been tagged to be put down in just three more days. 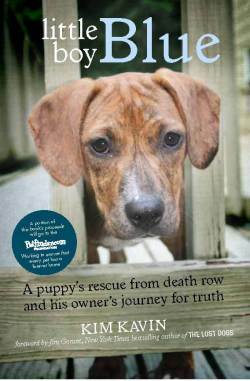 Little Boy Blue is the true story of one sweet puppy’s journey of survival. It’s also a shocking exposé that describes a brutal ongoing reality inside some of this country’s taxpayer-funded shelters. But Little Boy Blue also tells an inspiring story of the grass-roots rescue network that has exploded across the nation in recent years. Readers will come to know and love a very special dog who now brings smiles to the faces of everyone he meets. From a single click of Kim Kavin’s computer mouse, Blue’s journey of a lifetime began. This is the story of Little Boy Blue, told with candor and a great deal of love. In all shapes and sizes, all colors and materials, no longer are birdbaths relegated to the mundane, heavy concrete pedestal types. Handcrafted by artists who have a passion for birds, today’s baths are sure to entice some new feathered friends to your place and look great while doing so! 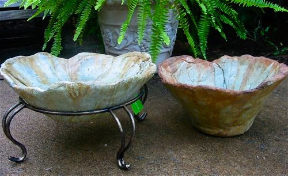 Many have matching planters or urns, and when placed in close proximity, they create a unique focal point in any landscape, or garden, porch, deck, or patio! Fresh water is the best way to do it, you can really attract birds with nary a feeder or birdhouse. 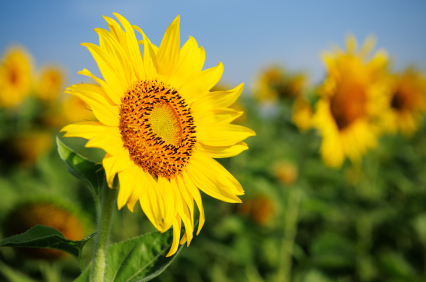 Use a native, flowering plant in the pot and you’ve got a food source! Deck baths are quite popular for those with small yards… or no yards at all. You can catch some fantastic views of unassuming birds from inside your home too. Hanging baths offer birds protection should ground predators lurk around your home (cats). The set shown above is light-weight & durable, and hand crafted from 60% recycled materials. The organic shape and textured design are cool enough to display them inside as decorative accent pieces… but the birds really won’t appreciate that at all! 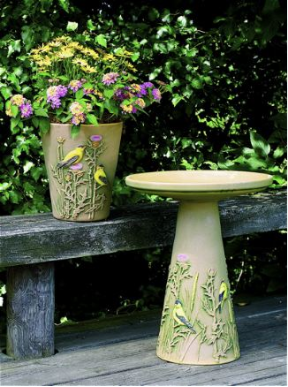 Hand painted birdbaths serve as functional art for the garden, and this Goldfinch bath and planter are no exception. Crafted from fine clay, they may be a bit heavier than some of the recycled materials, or poly-stone resin baths, but nowhere near the weight of concrete. 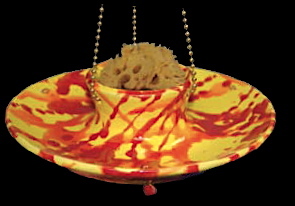 Some folks wonder “what’s the best birdbath to get?” It is by far, the one you will maintain! Fresh water is a must, and it’s the only thing you have to do… keep it clean! So think about what will be easiest for you, because the birds will use and enjoy any fresh water source you provide! Wait… no deeper than 2-3 inches, it’s the optimal depth for birds to bathe and wade safely. If the bowl is deeper, just don’t fill it to the top. A large rock may be placed in the center for birds to land and perch as well.